Big, black and beautiful, the 81.27 metre Oceanco motor yacht Alfa Nero makes an incredibly powerful impression, which seems to symbolise the desire of her builders to thrust themselves to the forefront of European luxury yacht building. Although she is so large, the secret feature of Alfa Nero is that she is definitely not ‘high volume’ in the sense of trying to cram in every possible cubic metre of accommodation like a modern cruise ship. On the contrary, the first impression you receive on stepping aboard is of wide open decks leading into big uncrowded rooms. The exterior and layout designers Nuvolari Lenard clearly agree with the notion that the ultimate luxury afloat is open space. In fact, with four decks to play with and only twelve guests to accommodate, they could afford to be exceptionally generous in their use of space. The most spectacular visual trick is the first one you see: a sizeable swimming pool with a built-in current and an ‘infinity’ aft side where the water overflows across a large sloping sheet of glass to create a waterfall effect. This is particularly effective at night when both the pool and the waterfall are under-lit and the movement of the water creates an ever-changing light show. The pool is set in a wide expanse of open deck which extends well aft from the superstructure, creating a lido which can equally well serve as a party deck. Having been one of the first designers to explore the possibilities of art deco afloat, Alberto Pinto has moved forward to the even more surprising era of pop art with the work of Roy Lichtenstein providing the inspiration. In addition to a number of Lichtenstein prints in his famous comic-strip style, Alberto Pinto has managed to create an entire decor based on them with zigs-zags of woodwork or kid leather, bold stripes of flooring, swirling patterns on upholstery, bright primary colours for lacquered woodwork, or high-gloss zebrano with its vibrant stripey grain. 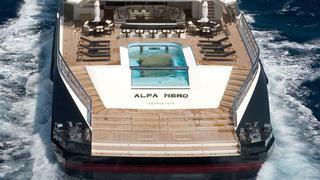 It is very apparent from Alfa Nero that Oceanco is very keen to move the business of building luxury yachts forward. 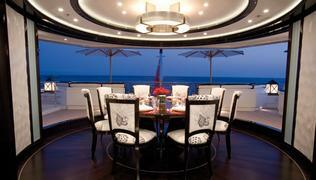 They showed the way with Amevi and Alfa Nero is another big step away from traditional yachting values. Here you will find no gracious oak panelled rooms, nor any varnished teak capping rails – all is new and modern. This is a big vessel with a big crew, capable of giving unrivalled standards of comfort and service to a fortunate few. The overall impression is of an incredibly spacious yacht with large, uncrowded guest areas and generous cabins, while exceptional use has been made of the exterior decks. Looking up at Alfa Nero’s impressive outline, you might wonder what has become of pretty white yachts.